A total of four Allen & Heath iLive digital mixing systems were employed for the grand opening of the 2013 Vienna Music and Arts festival. The annual event is held in front of the historical City Hall in Vienna’s Rathaus Square, and iLives have been used to manage the event for the past four years. The large production utilised a number of different size consoles to manage the various acts, which incorporates the final of the Eurovision Young Musicians Contest. The finalists were supported by the Radio Symphonic Orchestra Vienna (RSO Vienna), and support acts included seven-piece brass band, Mnozil Brass, and The Percussive Planet, featuring Martin Grubinger on various instruments. A modular iDR10 MixRack with iLive-144 Surface were employed for the main contest and the symphonic orchestra, plus an iDR-48 with iLive-T112 surface for The Percussive Planet, and an iDR-16 with an iLive-R72 surface for Mnozil Brass. A separate and dedicated IDR0 rack was used for signal distribution and the playout of the various loudspeaker feeds via an Ethersound network, whilst another iDR-48 rack and iLive-T112 surface were used for monitoring on stage. The main FOH console was fed with 64 channels and the T112 at FOH employed 36 channels for the support act, plus another 16 channels for the Mnozil Brass band. Monitoring on Stage was handled through 48 channels, plus an Ambisonic simulation for the Symphonic orchestra. Signal routing and distribution was handled via Ethersound and ACE connections. 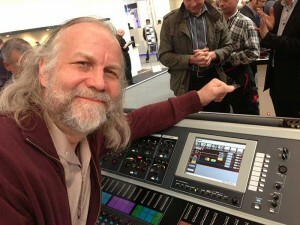 In picture: Adolf Toegel with iLive on an A&H booth at a recent trade show.